Our large, 80 year old vacation home was completely renovated in 2001. There is a tiled coal heater in the cozy living room and a wood / coal heater in the dining room. There is a 25 meter driveway which leads to the house from a cul-de-sac. The road turns into a hiking path, which leads to the mountains. A wonderful house in a wonderful location! We had a very enjoyable stay in this attractive house in northern Bohemia. It lies in a charmingly unspoilt position by a clear rushing stream with a forest rising beyond it. The neighbours are friendly and helpful and there is a small shop nearby.There are wonderful walks all around and good views of the valleys and surrounding towns which were so important to the Bohemian glass production. 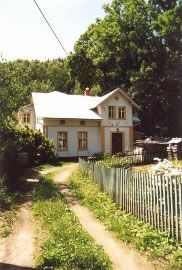 The rail links are exceptionally useful and the station of Desna is within walking distance, a great plus for visitors. A short drive takes one to the supermarkets and shops of Tanvald. The house is well equipped particularly the kitchen and the beds comfortable with ample bedding. The sitting room is spacious and light with an efficient woodburning stove and comfortable sofas.. The airy dining room has great views and a generously large table. Heerlijk huis aan een beek. Ook geschikt voor twee gezinnen. het is ongeveer 20 minuten naar het ski resort. Een prima uitvalsbasis. Je bent echt weg van de massa. We hebben voor volgend jaar weer geboekt! The town is located at the edge of the Iser and the Suedeten mountains. From this area, you will have numerous possibilities for both cultural and sporting outings. Ski: The house lies at the edge of the Iser and giant mountains with many opportunities to go skiing and cross-country skiing. There are runways with a skilift in both the village and in Albrechtice (3 km). Near the house you can go sledging and cross-country skiing. Ski equipment rental in Tanvald and Harrachov.